Lent is meant to be a time of waiting and reflection. We do little to decorate and refrain from grand celebration, pausing instead to focus on prayer, almsgiving, and fasting. 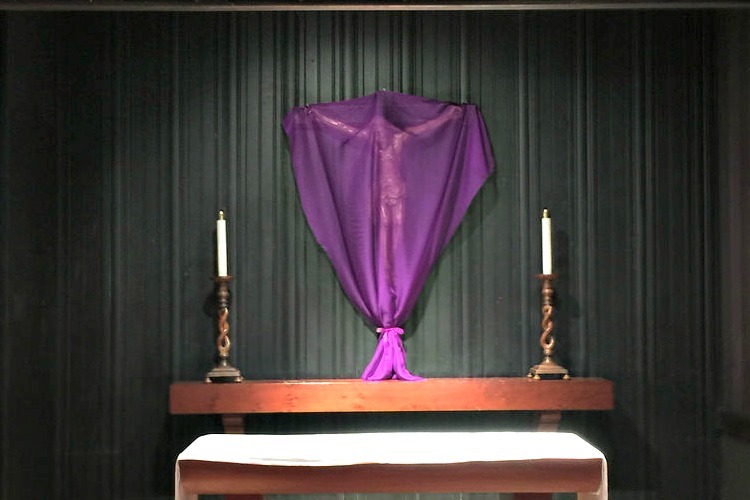 Purple may be used to designate lent and some homes like ours choose to cover any displayed crucifixes with a purple swag or cloth. As we enter Holy Week we begin to acknowledge and grapple with the historical events that make Jesus our Savior. So much happens during Holy Week that is crucial to a more thorough understanding of our faith. Every year, I have the best of intentions to honor these days with the kids through activities and projects. Yet, in this season of life (with three kids four and under), just getting us to mass for Holy Thursday and Good Friday can be overwhelming. I don’t want to craft and create things with the kids simply to decorate my mantle with one more cotton ball sheep or cross made from tongue depressors (although, I do love creating those things with the kids). The main reason I want to spend time making things during Holy Week is to spend time with the kids talking about Jesus. I want to carve out some moments in these days that can be spent explaining our faith. Often when little hands are busy creating something they ask, “Why?” and “Why?” is a great question that should be asked by all of us at Easter. So, I looked for alternatives to crafts that would still result in some discussion. 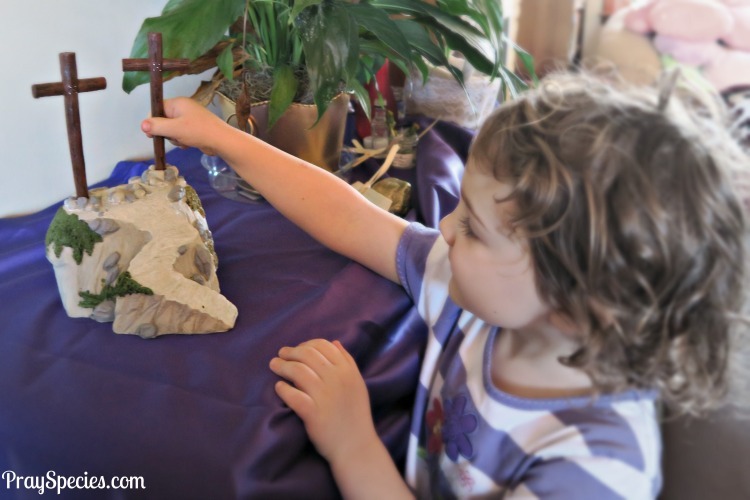 I really wanted a more visual way to show the kids the moments leading to Jesus’s crucifixion and resurrection without pulling out the glue and Popsicle sticks. 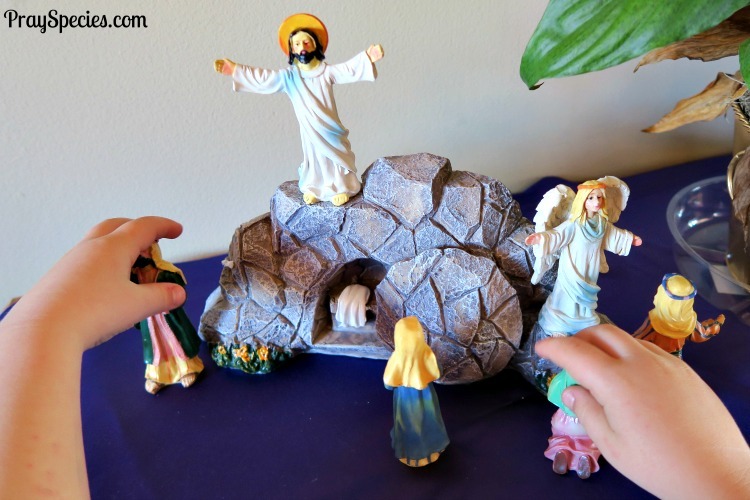 I went looking for a display or set of figurines that would show Holy Week in my home, much the way the Nativity shows Advent and Christmas during December. The Nativity Set is a huge part of why my kids are interested and familiar with Jesus, Mary, and the Three Kings. So, I hoped that purchasing a set depicting Holy Week would lead to similar questions and discussion. I was surprised and thrilled to find exactly what I was looking for at Oriental Trading. I was even happier when they agreed to send me the sets in exchange for sharing my experience with you. 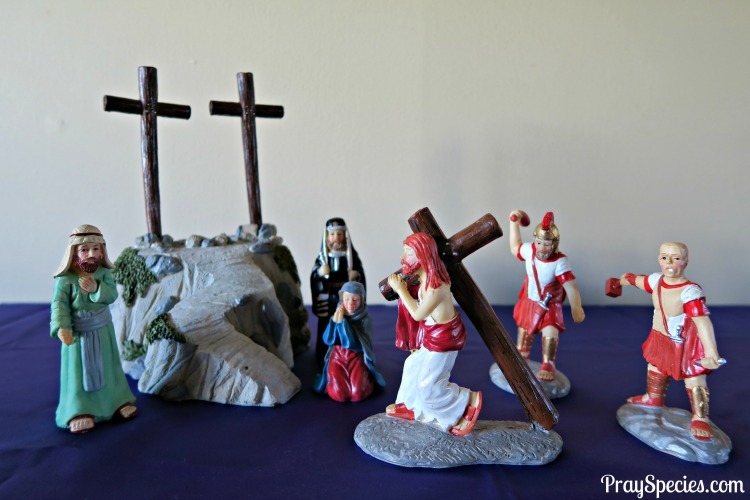 These display sets show Psalm Sunday, Jesus carrying His cross, and the Resurrection. 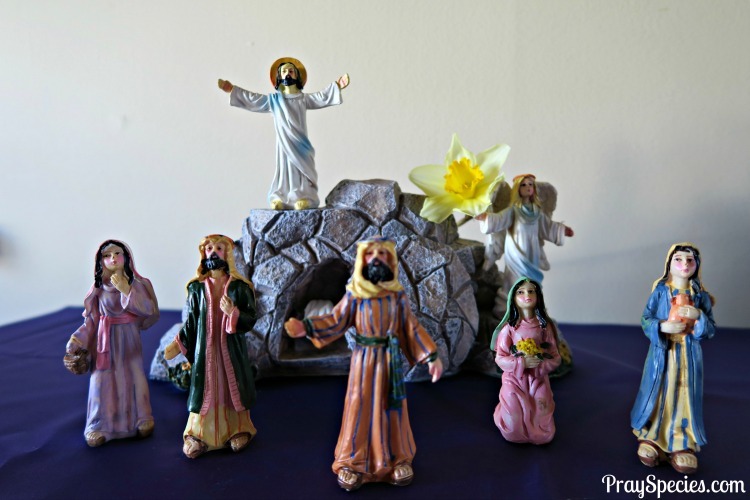 They are very similar to a display set we use of the nativity sets I often display for Christmas. So, far I’ve been very pleased with the questions and discussion generated by these sets. I’m looking forward to more with as we set up our new sets for Holy Week. The kids are enamored with the sets and have already begun to ask more questions. The sets do not require much set up, although the crosses do need to be placed into the model of the mount of Calvary. This is simple and my four year old daughter, Ladybug was easily and happily able to complete this task. Ladybug was also happy to rearrange the figurines asking questions about what was happening in the scene. For the resurrection she was intent on making sure all the “people” were looking towards Jesus. We only had two major concerns with these sets. Unknown Durability: The figures were durable enough for rearranging and moving about by young hands, but we didn’t try doing anything more dramatic. One was dropped on the floor and survived, but we are actively trying to handle these carefully. We are keeping them on our “Celebration Table” to keep them “mostly” out of harms way. Jesus’s Hair is Different: The figurine of Jesus has a dramatically different hair color in the scene where he is carrying the cross. My kids decided this must be from blood from the crown of thorns. Please note there is no crown of thorns in the set. Overall the kits have been very effective for helping me show Holy Week in my home. They have aided conversation and really put the emphasis on Jesus, while we prepare for Easter. The kits are relatively inexpensive; as of 3-26-17 they range in price from $19.97 – $25.99. The Holy Week sets seen in this post are available at Oriental Trading. 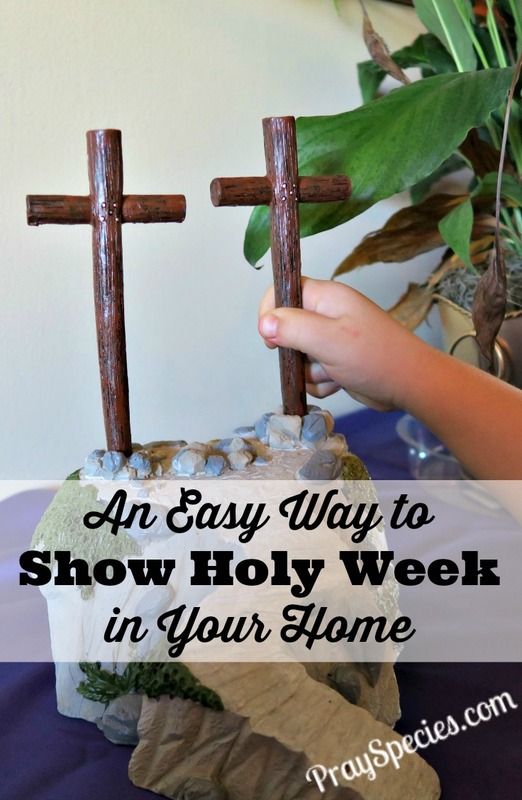 How are you honoring Holy Week in your home this year? P.S. The image below is perfect for pinning if you want to save this idea for next year! 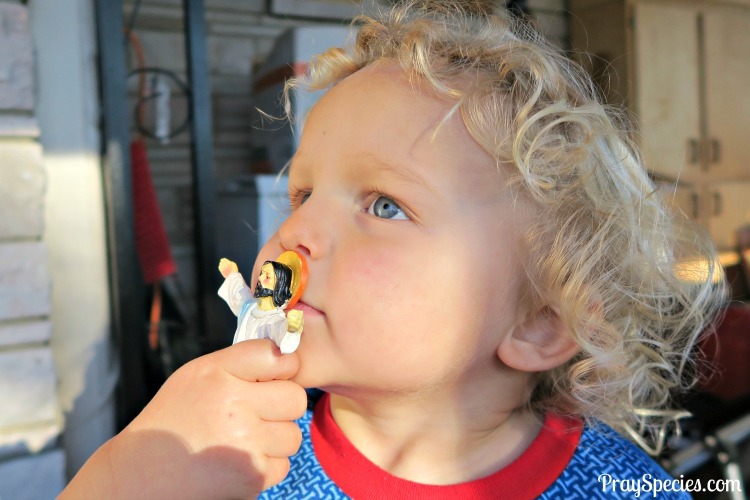 Almsgiving – Toddler Friendly Lent How to Make a Lent Paper Chain Ace Collins’ Magic of Christmas Prize Pack Win an Amy Grant Tennessee Christmas CD!